Sometimes, none of the pivot tables that Excel 2016 suggests when creating a new table with the Quick Analysis tool or the Recommended PivotTables command button fit the type of data summary you have in mind. Also, Excel 2016 supports analyzing data from multiple related tables on a worksheet (referred to as a Data Model). If the data in new pivot table you’re creating is to be analyzed along with another existing pivot table, be sure to select the Add This Data to the Data Model check box. If you indicate a new worksheet as the location for the new pivot table in the Create PivotTable dialog box, when you click OK, the program inserts a new worksheet at the front of the workbook with a blank grid for the new pivot table. It also opens a PivotTable Fields task pane on the right side of the Worksheet area and adds the PivotTable Tools contextual tab to the Ribbon (see the following figure). The PivotTable Fields task pane is divided into two areas: the Choose Fields to Add to Report list box with the names of all the fields in the data list you can select as the source of the table preceded by empty check boxes, and a Drag Fields between Areas Below section divided into four drop zones (FILTERS, COLUMNS, ROWS, and VALUES). Completed pivot table after adding the fields from the employee data list to the various drop zones. 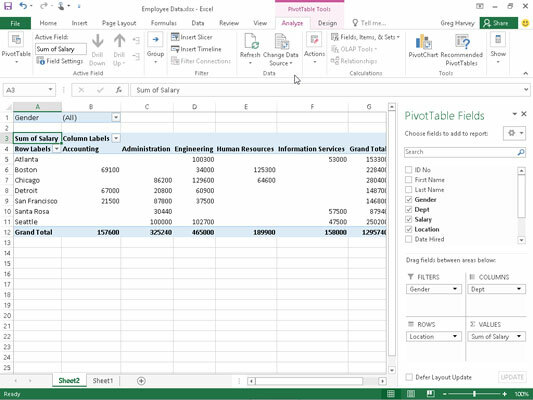 You can also insert a new worksheet with the blank pivot table grid like the one shown by selecting the Blank PivotTable button in the Recommended PivotTable dialog box or the Quick Analysis tool’s options palette (displayed only when Quick Analysis can’t suggest pivot tables for your data). Just be aware that when you select the Blank PivotTable button in this dialog box or palette, Excel 2016 does not first open the Create PivotTable dialog box. 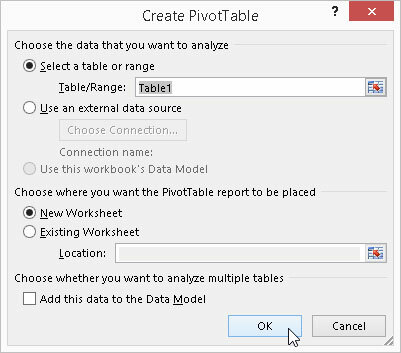 If you need to use any of the options offered in this dialog box in creating your new pivot table, you need to create the pivot table with the PivotTable command button rather than the Recommended PivotTables command button on the Insert Tab. FILTERS: This area contains the fields that enable you to page through the data summaries shown in the actual pivot table by filtering out sets of data — they act as the filters for the report. For example, if you designate the Year field from a data list as a report filter, you can display data summaries in the pivot table for individual years or for all years represented in the data list. To understand how these various zones relate to a pivot table, look at the completed pivot table shown. For this pivot table, the Gender field from the data list (a field that contains F [for female] or M [for male]) is assigned to indicate the employee’s gender in the FILTERS drop zone. The Dept field (that contains the names of the various departments in the company) is assigned to the COLUMNS drop zone, the Location field (that contains the names of the various cities with corporate offices) to the ROWS drop zone, and the Salary field to the VALUES drop zone.